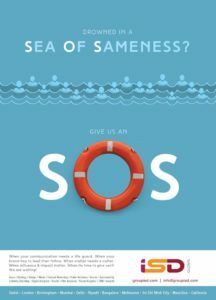 The Big Trap for Brands: A Sea of Sameness! Normal needs a new normalising! Since there is so much interest, let me start from the bottom line. It is no coincidence that damn near everything that you and me buy or want to buy, seems to have a label ‘ Made in China ‘. Now, that includes airplane wings …as well as caps! Instant knock offs-with excellence- have become the norm. From shoes to sweaters to computers to restaurants. The quality of damn near everything is terrific. Things that work well are not unusual. Things that don’t work are unusual. By design or accident, we are afloat, awash, adrift…in a Sea of Sameness. High-quality sameness, but sameness nonethless. An idea that has legs ..lasts only a few weeks, a few months at best. Then the sequel. And the sequel that follows the sequel. And so on. Sure heard this before. Herd mentality. We race around. Follow each other’s tails. From Hollywood to Silicon Valley to Madison Avenue to Jamal Abdul Nasar Street. As Swedish business professors Kjell Nordstrom and Jonas Ridderstrale brilliantly articulated in their book ‘ Funky Business ‘, ” The surplus society has a surplus of similar companies, employing similar people, with almost similar educational backgrounds..coming up with similar ideas, producing similar things, with similar prices..and similar qualities “. Ouch, that is painful! The 10X/10X theory on that is that you could be 10 times better. While being ten times less different. “. It’s no longer exceptional for stuff (anything, everything ) to work. Which means the bar for ” standing out ” has risen dramatically. In a winner takes all world, Normal = Nothing. So time to stop being goddamn normal. Dovetailing seamlessly into this line of thought is the Danish marketing phenomenon Jesper Kunde’s articulation ” Companies have defined so much best practice that they are now more or less identical. ” It’s commoditised. Instead, how about ” It’s yet to be practiced “? In other words, the only way to make a difference is to, well, “ Make a Difference “. Standing out in a world where most everything works is stupefying difficult. And yet some companies are making a go of it. How I hate the word ‘ normal ‘. We are in a ” Don’t just sit there economy ” – so, embrace abnormal. Never mind if you are first mover, last mover, first follower or fast follower. Go for it! Previous Previous post: Does the world need another ad agency? Next Next post: Nothing else but ONLY only matters!